Two genes normally work together to suppress the development of colon cancer. Their combined loss favors tumorigenesis and stimulates the formation of metastases. Colon cancers can be successfully treated by surgical resection if the illness is already diagnosed after the appearance of the primary tumor. However, when the disease progresses further, the metastatic tumors that arise are the most frequent cause of death in patients with this type of cancer. An understanding of the molecular mechanisms that drive the process of metastasis in such patients is therefore crucial to efforts to improve survival rates. Tumorigenesis in the colon essentially results from the loss of function of specific tumor suppressor genes. These genes code for factors that serve as brakes to tumor growth by controlling the rate of cell division and survival in the epithelium in this region of the gastrointestinal tract. In addition, p53 and miR-34a inhibit migration and invasion of tumor cells and thereby prevent the formation of metastases. A team led by Heiko Hermeking, Professor of Experimental and Molecular Pathology at LMU, has found that in the 50% of cases in which metastases develop, the genes that code for the protein p53 and the microRNA miR-34a are inactivated. In order to trace the consequences of this twofold inactivation, they inactivated these genes in a mouse model for colon cancer, and identified signal pathways which could potentially serve as effective drug targets for the treatment of the disease. Their findings appear in the journal Gastroenterology. The study reveals that “the combined loss of both genes is associated with an upsurge in the frequency and size of colon tumors, and a increase in their propensity to invade surrounding tissues and seed metastases,” says Heiko Hermeking. These findings demonstrate that the two genes normally function as suppressors of colon tumorigenesis. Indeed, Hermeking and his colleagues show that they act together to inhibit the activation of signal pathways which promote the survival and stimulate the invasiveness of tumor cells. Thus the microRNA miR-34a inhibits the production of the protein IL-6R. 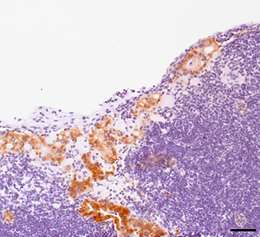 IL-6R is a cell-surface receptor that is activated by binding of the cytokine interleukin 6 (IL-6), which is synthesized and released by cells nearby the tumor (the so-called tumor stroma). The interaction between the two proteins activates what is called an epithelial-to-mesenchymal transition (EMT). The EMT transforms epithelial cells, which normally adhere to each other to form planar cell sheets, into mobile mesenchymal cells that are the primary mediators of metastasis formation. Furthermore, simultaneous loss of p53 and miR-34a activates the production of the protein PAI1, which in turn stimulates growth of primary tumors and also their invasion. In their experimental mouse model, the LMU researchers were able to show that therapeutic inactivation of the IL-6R/STAT3 and the PAI1 signaling pathways inhibits tumor growth and formation of metastases in colon cancers that have lost p53 and miR-34a function. The results of the study indicate that the IL-6R/STAT3 and PAI1 signaling pathways offer promising targets for the development of new drugs for the treatment of advanced colon cancer in patients. They plan to investigate this possibility further in upcoming studies.